The question prospective rescuers of Infrastructure Leasing and Financial Services Ltd (IL&FS) should be asking is whether they should treat the symptoms or the disease. Life Insurance Corporation of India (LIC) is apparently readying a bailout and is likely to be in a position to effect management changes, subsequently. IL&FS’s business structure has a fundamental flaw. As an investment company, it has no business of its own. It invests in subsidiaries, chiefly in infrastructure, financial services and education, which in turn invest in subsidiaries and associates—what is known as the special purpose vehicle model—executing projects. Again, the financial services entity invests in infrastructure and real estate, including in companies of the holding company. As the holding company, this structure exposes IL&FS to both the financial and project risks in the infrastructure sector. In good times, money will flow back from the subsidiaries as dividends, interest payments on loans from the parent and even sale of these subsidiaries or associate companies. During bad times, such as now, when these payments get backed up, the whole organization seizes up. And, when shareholders are reluctant to invest more equity and banks don’t give fresh loans or roll over existing ones, the game’s up. Consider IL&FS’s recent annual report. In FY18, its borrowings (long and short) jumped by a third, with short term rising 2.6 times to ₹ 3,400 crore. Where did this money go? Equity investors did not bring in capital during the year. This money was deployed in investments in its associates and subsidiaries, which increased by 3.6%, but long-term loans and advances rose by 79%. Most of this was to related parties, namely its subsidiaries and associates. For instance, unsecured loans to related parties rose from ₹ 317 crore in FY17 to ₹ 2,490 crore in FY18. 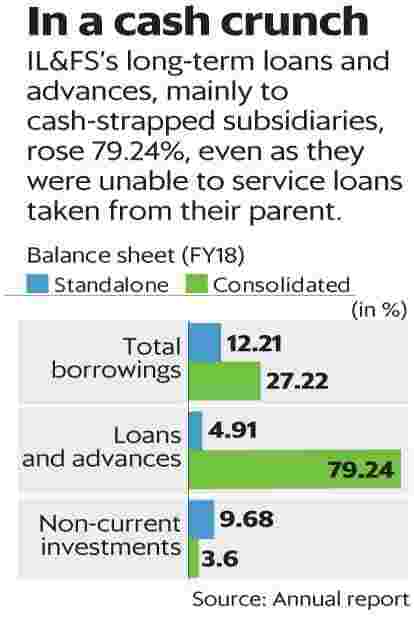 Since the subsidiaries are facing a cash crunch, leading to defaults, they perhaps don’t have the money to service loans taken from their parent. Subsidiaries are also unlikely to pay dividends if they can’t service loans. The standalone financials also reveal the mismatch in the maturity profile, with liability repayments coming up at shorter intervals, compared to its own advances that are due much later. The consolidated balance sheet tells a sobering story. Net worth declined by around a third due to losses, while its debt rose by 13.7%. Its debt-to-equity ratio rose to 18.7 times, compared to 11.5 times a year ago. Even then, IL&FS had close to 10% of its balance sheet in cash and cash equivalent as of March. This seems to have evaporated since then, considering the company defaulted on its commercial papers. But, what’s the way out? Given the unpredictable state of infrastructure projects, the vulnerability in IL&FS’s model of taking on the financial and project risks has been exposed. Unless its shareholders write it a blank cheque, which they haven’t, in periods of stress the edifice can crumble. That’s the risk it is facing now. The begging bowl is out for approximately ₹ 4,500 crore, but even its patrons are hamstrung to offer immediate help. LIC already holds 25% in the company and to jack it up further, the insurance behemoth will need special permission. Recall the recent special dispensation to become IDBI Bank’s owner and the insurance regulator is unlikely to give a similar free pass again. Others are banks such as the State Bank of India (SBI) and Central Bank of India (CBI) and mortgage lender Housing Development Finance Corp. Ltd (HDFC). An IL&FS bailout appears to be on the cards. The right move will be to tide over the current crisis and then carry out a comprehensive overhaul of the manner in which the business is organized, decide which side of the business IL&FS wants to be on and then do only that. A proper risk management approach should have also ensured that the group did not keep increasing its exposure, both to loans and projects, when it became clear that operational issues would delay cash flows from its existing portfolio. A fresh infusion will bring IL&FS out of the cash crunch. But unless the fundamental issues are addressed, it is just about kicking the can down the road.